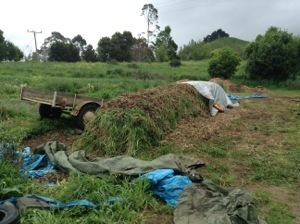 The Compost Pile – We worked like mules and at the end of the day had a rotting pile of poop with a tarp on top! One of the rules of organic farming is that all compost has to come up over 56 degrees Celsius (120ish F) for 3 consecutive days in order to kill any parasites from non-organic materials. We used four ingredients: mulch from non-sprayed trees (almost organic), horse poop (non-organic), leaves/sticks washed up on the local beach (non-organic), and green grass fresh cut from the farm (organic). We built layers of the first three ingredients, with a thick layer of green grass in between each layer, until we had a pile about a three feet wide, 4.5 feet tall and about 30 feet long. We then threw tarps over it to contain the heat and hoped for the best. Four days later the thermometer read 66C (140ish F) and held for almost a week. Success!! Pinnacles Tramp – One of our first days that we took as a break from the farm was filled with a day hike up to an area called The Pinnacles. The Pinnacles is a very steep mountainous area from old volcanic events that ends up being the high point in the middle of a 30mi wide peninsula. From the top we were able to see the ocean and farms on both sides of the spine that runs up the middle of the peninsula. It was very interesting to note the incredible amount of effort and development that made this hike manageable as it was recovered land from the old logging days of taking down the native forest; much of the walking path was built from a painstakingly difficult horse trail that brought supplies into the mountainside in the early 1920s. 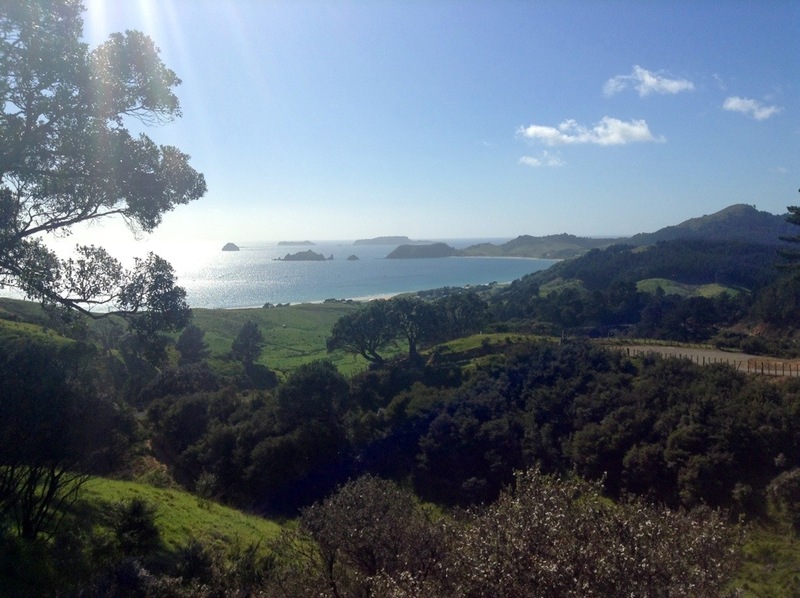 A view off the Coromandel Peninsula while we were took Labour Weekend off from work. Beef, it’s what’s for dinner – Our first two weeks at the farm we were scraping the bottom of the meat barrel as the previous “beast” had been killed several months ago and the meat selection was low. The chickens were also eaten a couple weeks ago and the cows which are farmed for beef were not big enough to be killed… until today! Nick the “Homekill Guy” showed up with his outfitted 4-wheel drive truck, 6’x10′ trailer, and .223 rifle. About ten minutes later the chosen mature steer laid on the ground and Nick was sharpening his knives. 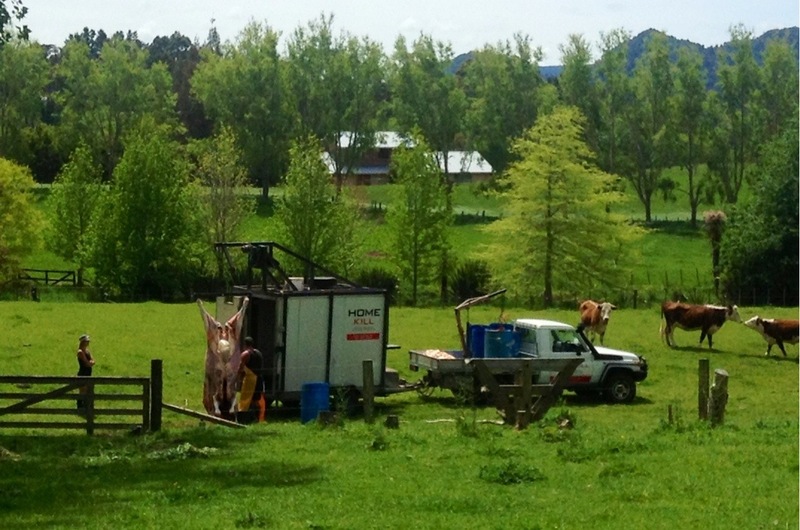 About only thirty minutes from when the beast hit the ground, it had been quartered and put into the back of his trailer with the other 3 that he had processed since lunch. The hide was in one barrel to send to Italy for leather, organs in another to be turned into dog food, and 4 quarters of the cow on his way to the butcher’s in the back of the truck. Halloween in New Zealand – Honestly, a bit of a let down. Halloween hasn’t really caught on over here so what did we do? We went out and had a beach party with a bonfire! Of course it rained and the kiwis had to prove how tough they were and no one wanted to be the first one to quit. Hey, at least Linds got to sample all of the candy and I cleaned up the box of cookies no one wanted. Hot Water Beach – Our final tourist experience on the peninsula was also the most popular tourist stop for the region. Hot Water Beach is one of those experiences that you just couldn’t miss while in New Zealand! We had spent the morning at a different beach, lying in the sun and playing in the water at the picturesque Cathedral Cove, and then took a short drive to world famous Hot Water Beach. We had borrowed 2 shovels from the farm that we used to dig a bathtub-sized hole in the sand, which during low tide would fill with steaming hot water from a thermal spring behind the beachhead. As the spring made it to the ocean it fanned out and we were surrounded by 250 of our closest friends digging their own jacuzzi in the sand. Talk about a sandy experience – our bottoms were absolutely filled with fine sand!